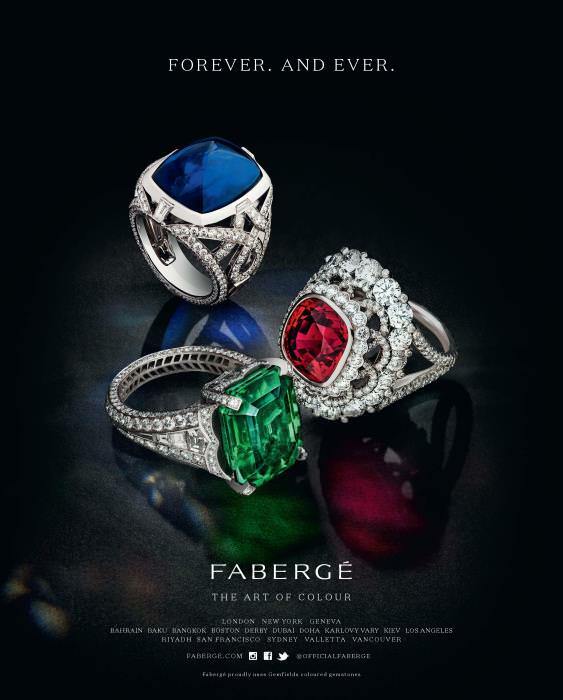 CIJ International Jewellery TRENDS & COLOURS - IN THE PRESS: Fabergé - "FOREVER. AND EVER"
Fabergé - "FOREVER. AND EVER"
Fabergé is launching a new campaign this autumn with the tagline "FOREVER. AND EVER"
Fabergé (wholly-owned by the immensely successful coloured gemstone miner Gemfields), gets witty with a tongue-in-cheek reference to the long-standing tagline deployed in the diamond industry. Fabergé and Gemfields’ confidence is clearly at an all-time high following the resurgence of demand for coloured gemstones in recent years. With emeralds, rubies and sapphires being many times rarer than diamonds, and the legacy they provide for generations to come, nothing says luxury or individuality like the Fabergé Devotion Collection. The Devotion Collection exemplifies ‘the art of colour’, seamlessly fusing extraordinary coloured gemstones, artistic ingenuity and exceptional craftsmanship. Creative fantasy is paired with technical perfection and a sumptuous colour palette. This collection celebrates special lifetime events, milestones and memorable moments with inspirational gemstone-set engagement, anniversary and celebratory rings. Fabergé’s vibrant gemstones are chosen for their exquisite colour, cut, clarity and character. The Devotion Collection offers both ornate and sleek designs, catering to both contemporary and classical tastes.